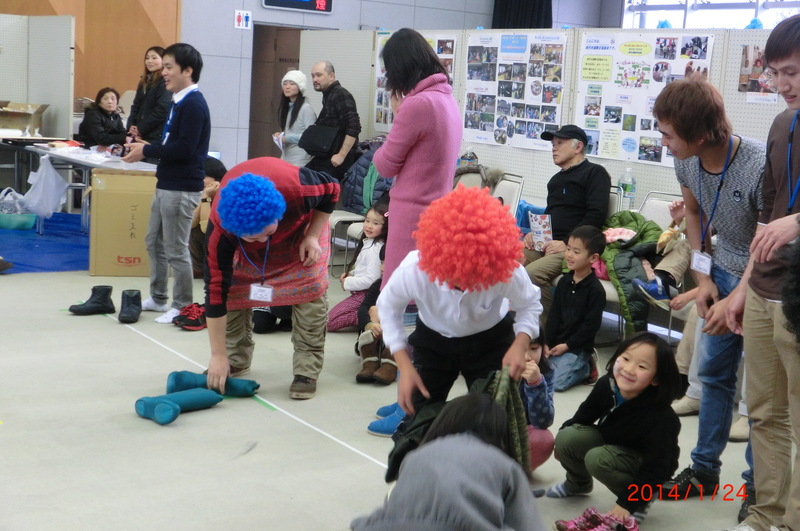 On January 26th I participated for the second time in the Nantan Kids Carnival as a representative of France. This year’s theme was “world games” so I prepared two games and one craft activity. Both games are usually found in French school festivals, called “kermesse” in French. One is called “Chamboule tout”. You first use some old boxes or cans that you let the kids decorate beforehand (or you decorate them yourself if you want to revive childhood memories!). You then pile them up on a table, and kids have to throw balls at them from a distance and make fall as many boxes as they can within the limited number of throws they are allowed. The Nantan staff had prepared some amazing ghost baskets and the kids went crazy for them. The other game is called “la queue de l’ane”. Children are blindfolded and have to pin a tail back on the drawing of a donkey. 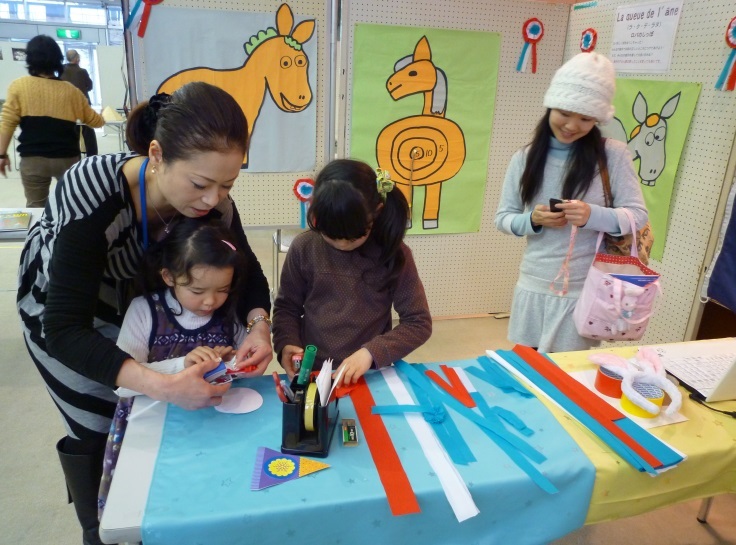 Lastly, in the craft activity, children could try making a “cocarde”, the flower of the French revolution. Using blue, white and red crepe paper, they would first make the flower and then the three-colored stripes hanging at the bottom. They then put their work on their shirts and hats and I was very happy to see them walk around the event hall wearing the colors of France! Other booths introduced games from China, the Philippines and Vietnam. You could also get your face painted at the New Zealand booth, bake some animal shaped cookies at the Germany booth, and try on ethnic costumes at the JICA booth. 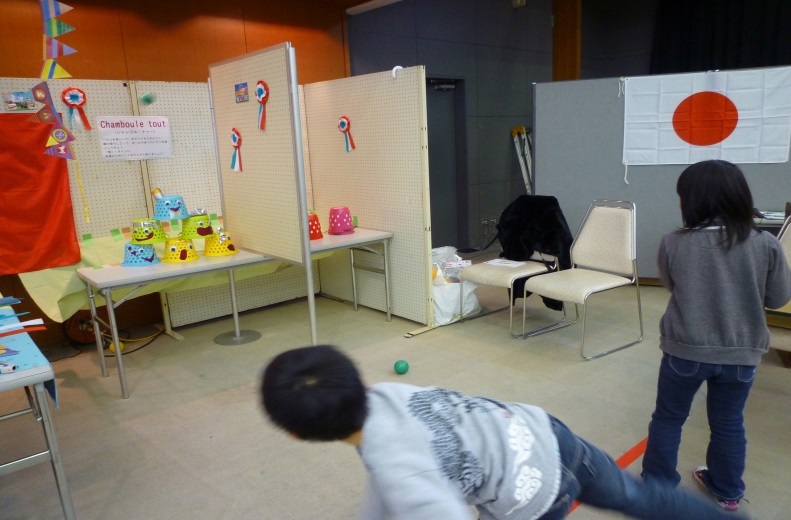 To close the event, we did 2 giant games with everyone. The first one was a school festival game from France called “relais deguise” (costume race). Divided in teams, children had to put on a costume with an afro wig, a giant skirt and rain boots that were too big, and rush to the other side of the room. They then had to give the costume to the next person and so on. It was a lot of fun to see everybody in such strange outfits running all over the place! The last game was a Filipino game called “stop dance”. You had to dance in groups around a newspaper page and when the music stopped everybody had to stand on the paper. Every round you fold the paper in half, so there is almost no space in the end to stand and everybody was lifting or giving a piggyback to the kids, holding on each other etc. It was a really fun way to get closer and know each other! We had more than 100 participants this year, and it was a lot of fun. Kids seemed to really enjoy knocking off the ghost baskets at the French booth as well as getting to know a lot of games and culture from various parts of the world. Steven from Seika here. 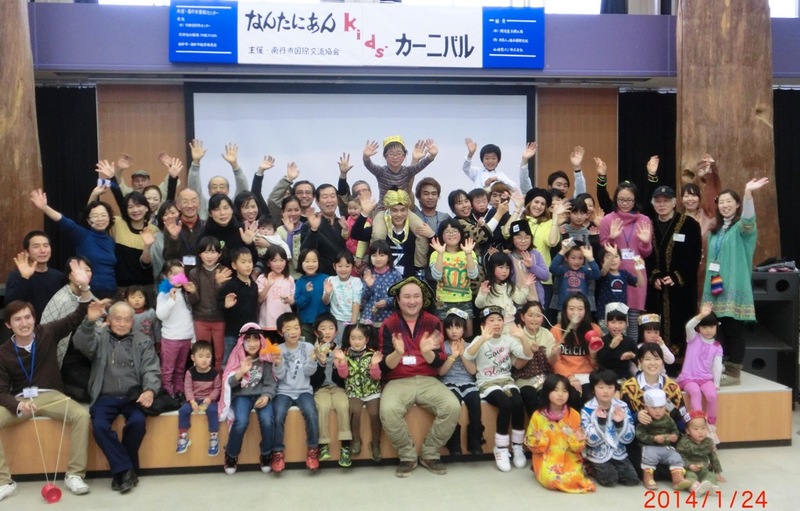 In this article, I would like to talk about lectures I gave in January, February, and March. With these, my lecture series about America has ended, at least for the 2013 fiscal year. The January lecture took place on Thursday, the 9th. The theme was demographic trends in the United States. Unlike Japan, the population of the United States is growing, thanks mostly to immigration. Also, while the American population is graying, it is not doing so at the same rate as the Japanese population; currently, approximately 1 in 8 Americans is 65 or over, compared to about 1 in 4 Japanese people. I also talked about how ethnic makeup varies by region, and how the American population is getting less and less white. In fact, the single largest source of immigrants to America now is Asia, although most of these immigrants come from China, India, and the Philippines, rather than Japan. The February lecture took place on February 6th, also a Thursday. The subject was Japanese-American history. First, I explained that the word “Japanese-American” was not as straightforward as it seemed, and that there are people who do not necessarily identify with or speak the language of the country whose citizenship they hold. Then I talked about the history of Japanese immigration to the United States and the laws which not only limited such immigration but discriminated against people of Japanese descent already living in the United States. 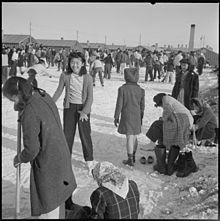 Of course, I also talked about World War II, both the internment of Japanese-Americans living on the West Coast and their contribution to the American war effort regardless. I then ended the lecture with current examples of Japanese culture in the United States. The final lecture for FY 2013 took place on Thursday, March 6th. I talked about the American entertainment industry, showing participants clips from various American television shows and movies. I talked about various types of shows, such as sitcoms, reality shows, and sports shows, and mentioned various popular genres. While some American shows and movies have become popular in Japan, I felt that these only reflect a portion of American media; hence, my goal was to show a representative cross-section of what Americans watch. That about wraps it up, at least for now. 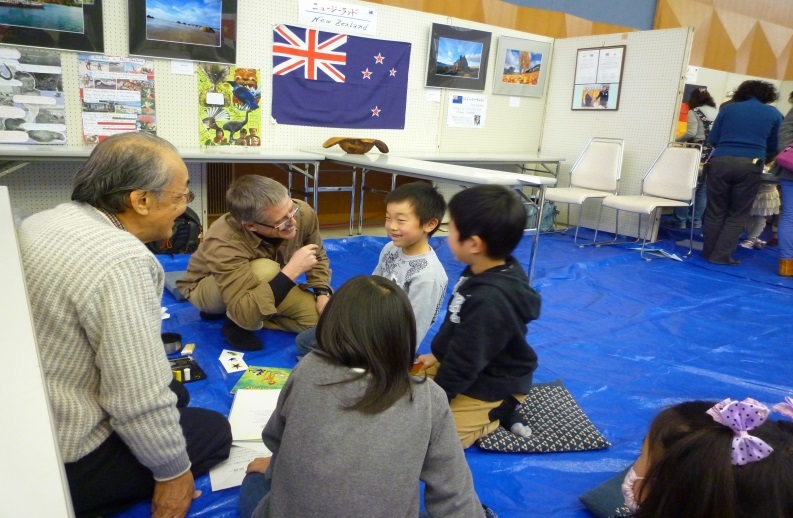 I look forward to having more discussions about America with the people of Seika in the future!